This is a small bonus post for you really eager long distance riders. 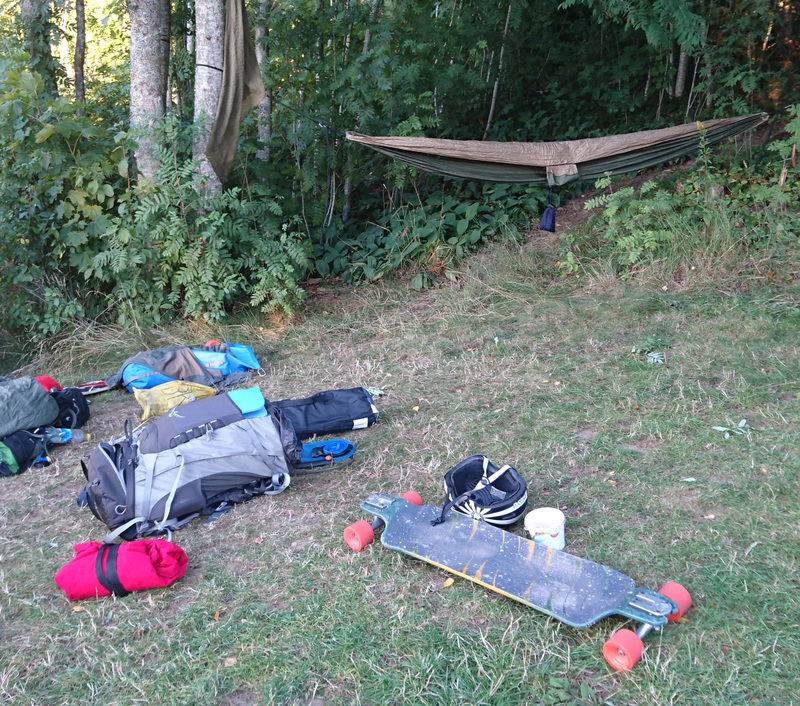 Recently I tried putting all my pack on a separate board that I pulled behind me using a Longboard Larry hitch. I was able to buy it from the awesome Anders Karlsson who used it to help him ride across Australia. With the hitch I also got a back truck from him as well. It’s quite a bit wider than a normal truck and normally used on mountainboards. Having it that wide helps keep it a bit more stable. I already had an extra set of classic Orangatang In Heats so I used two of those. I have to say right off the bat, it was amazing to not have any real weight on my shoulders while riding. I’m used to 10-12kg on my shoulders and I’ve had issues with backpain after a full day’s riding so this was a great solution in that aspect. But, not everything was nice and rosy. Instead every push required more force to pull the whole weight forward. So even though I was able to push more often as bending down isn’t as straining as before, the weight of the packboard made each push weaker and forcing me to push pretty much continously. And in the end I’d guess it takes just as much energy as when using a backpack and probably takes about the same amount of time. And I believe uphill was probably even harder than just having the weight on your back. Another negative is that having the board tip is a new problem. It didn’t take much of a carving turn for me to have the board flip on its side. Because once it flips, it can quickly ruin gear. For me it cut through my dry-bag and almost damaged my sleeping mat. So I had to go very slowly down any hill I was uncertain of handling. Lowering the center of gravity on the pack board would help but that’s made trickier because I want to be able to carry it as a backpack. Sometimes you just have to walk stretches of road for various reasons so I wanted to make it easy to pickup and carry when needed. I’m going to have to think over it a bit more, do I want to have an easier time for my back or do I want to carve and be able to go downhill faster? We’ll see. We’ve gone through a lot of info already but this last post will be dedicated to rest of the gear I use. Much of it is just reusing stuff I already have to save on money, with occasional upgrades over time. But if you want to hear what’s the best from one of the best then I’d recommend checking out Adam Coltons packing video. I mean, check it out anyway, he’s a beast and he knows what he’s doing. The stuff I mention and link is what I use and fits me but make sure to check around for other things, everyone has different tastes and preferences. Lets start with what I’m actually wearing when riding. I always wear a skate helmet as mentioned previously. On my upper body I’ve been pretty happy with using a thin Merino-wool shirt, it keeps you pretty cool during the day and warm and snug when it gets late (maybe bring a windbreaker still). A light and stretchy pair of pants work great both in hot summer and cool spring/autumn. If you need more warmth then work with layers by bringing underclothes. When it comes to shoes I’ve really just used what ever I’ve had on hand that’s too worn out for regular use. So they’re already worn in and I just use them for longboarding until they finally give up. It’s preferable with pretty breathable ones with a somewhat hard sole to handle the footbreaking. Which is something skate shoes have trouble with, as they get worn out quickly as the sole is soft. Of course the most important point is that the shoes need to be comfortable as you’ll be riding in them for many hours. A second set of comfortable clothes can be nice if you want to hang out with people and feel fresh. Though make sure to think of how much space and weight it’ll add. Which brings us to where to put all your stuff; because you’ll have a bunch of things you’ll want to bring with you. I’m not going to go through every single item I bring, I’ll just go through the most important things. Do keep in mind that when packing it’s all too easy to just keep adding things you’ll be fine without so really think through what you really need and why. Because every kilo matters a lot as the more you have to carry, the heavier it is to push. For myself I use a Osprey backpack with 68L of space but whatever you get just make sure to find one with a good waist-strap so you can offload the weight from your sholders onto your hips. And see to packing everything tight so you maximize the space you’re using as well as keeping things from rattling around in your pack. It’s not that awkward and it works perfectly in Sweden. Sure, people might be a bit surprised at first when you swing around their house asking for water, but many quickly get curious and start asking questions. So usually I get to have a nice chat with interesting new people. Lets get into camping gear. 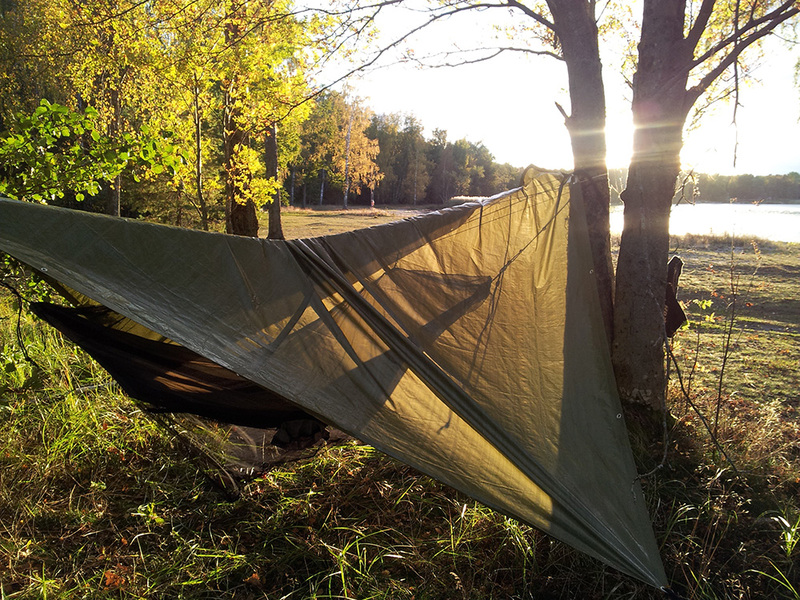 The last couple of years I’ve started using a hammock with a tarp. 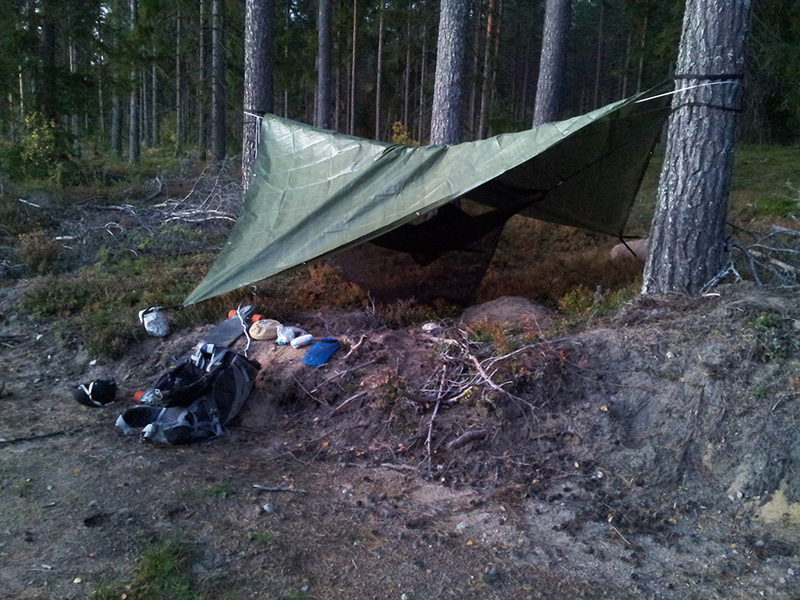 Add a sleeping mat & sleeping bag and it’s more comfortable than on the ground in my opinion. The mat is pretty new so haven’t really tried it out yet and the sleeping bag I use varies based on what part of the season I’m doing a trip in; I’ve kinda borrowed ones that fits my needs. It can be a bit tricky to get the hammock to hang correctly, you need to get the right amount of slack in it to lay somewhat sideways. And it takes a few minutes of adjusting to get comfortable as things have a tendency to slide to the middle as you move around. At the same time the sides of the hammock is constantly pushing in on your body. But when everything is said and done, it can be close to perfect. And don’t underestimate cold air blowing by under the hammock; insulate any point your body touches the hammock. At first I was hoping to save space or weight with a hammock but you don’t really. 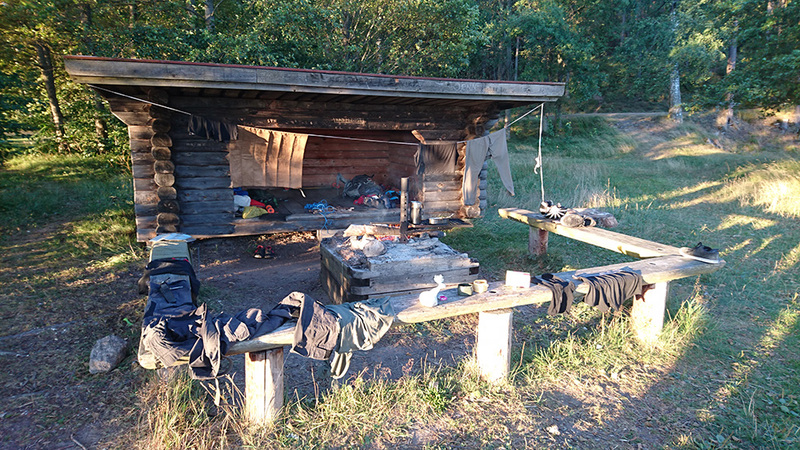 I’m just quickly going to mention a few other things that are worth bringing: first aid kit, a small cooking burner, flint-steel, battery-pack, a compact towel, an inflatable pillow (or just use your pack), light reflector, headlamp, alcoholic soap, sporks, a good knife and/or small saw, duct tape, rope, skate tool and ear plugs. I think that’ll have to do. I could probably go into endless detail into a lot of different things but I don’t think that wouldn’t actually give much valuable information. I hope you appreciated this series, maybe even started considering doing your own trips. Eitherway, if you have any questions or ideas then contact me using the links at the bottom of the page. Ok, it’s time to get real nerdy. Time to talk longboard gear. My setup might not be perfect but these are the things I’ve found works for me. One of the most important considerations is the simple question: how low can you go? It’s one of the main goals I’ve had when looking for a board before because the closer to the ground you can get the less energy you have to spend bending your knees to get down. Two things to look for is a dropped design where the actual board has a lowered platform and dropped trucks where the trucks are mounted through the board and screwed in from the top. There are drawbacks though, mainly that a lower clearance will make it harder to handle bumps in the road and especially any curbs you might want to cross. Expect your boards underside to get plenty scratched if it’s really low. Low boards might be very stiff too which I don’t like myself so I prefer a board with a small amount of flex to catch some of the vibrations and bumps in the road. The board that I’ve found I really like is the Subsonic GT40. Mine has a foam core to make it lighter and a carbon fiber bottom layer. With a little less than 5cm off to the ground it’s incredibly easy to push though I don’t think I’d want it any lower that that. It feels great to ride and it has held up well over the years. Your options might be a bit limited though, mine was imported from the US. 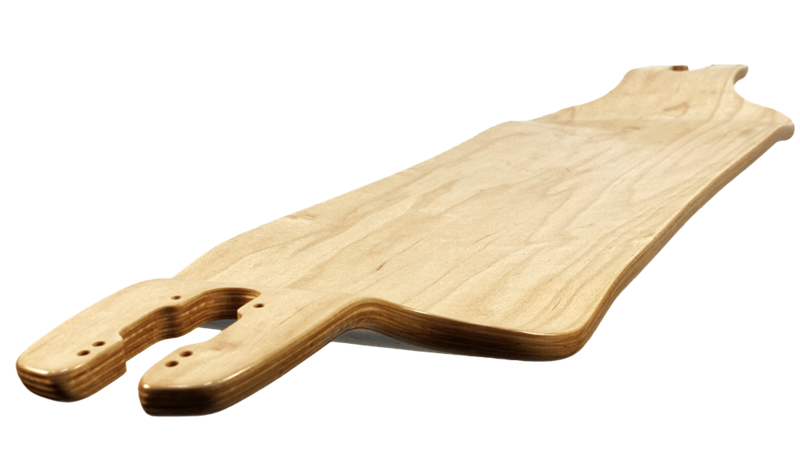 Longboard Larry has the Pusher 2.0 with either dropmount or topmount. Either seems to be just as awesome as the GT40 but is also difficult to find in europe. Rayne is a bigger brand and more easy to find with their Demonseed being a good choice. 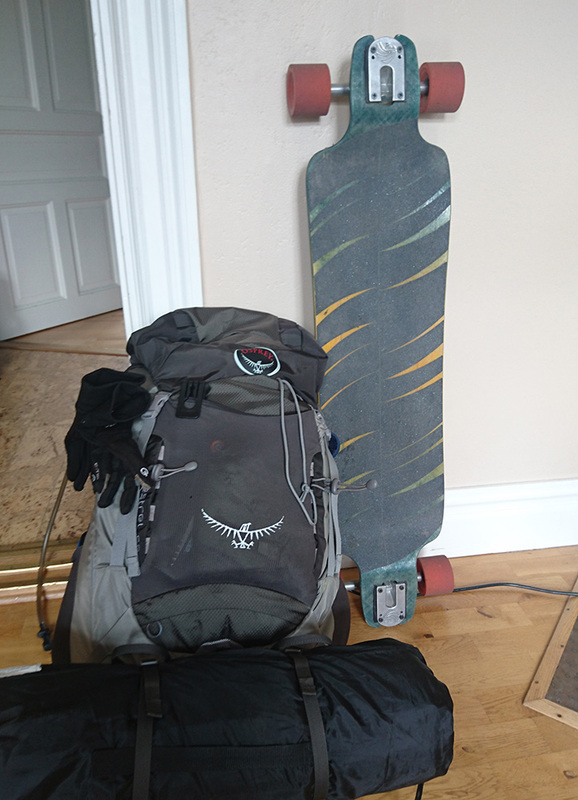 It’s the board that my travelmate Fredrik uses though I find it a tad too stiff for my taste. G-Bomb creates nice brackets that can get you real low as well, I have one of their older sets and liked them but the newer ones have an even larger, better drop. Don’t have as much to say there, I’ve pretty much always run with 180mm since they’re pretty stable at speeds. But going down to 150mm could be an option so you don’t accidentally trip on your wheels when pushing tired late at night. That’s happened a few times for me and it’s never fun. Randal RII or Paris V2 are good old classics though I could only get the Paris to fit on my GT40. And I’ve been pretty happy with the stock bushings on the Paris trucks so haven’t felt the need to change them. Worth mentioning that I do run my trucks slightly tighter than several of my friends. I should mention that I also run a thin set of shock pads between the trucks and the board. When it comes to wheels there seems to be differing opinion on size, some like large wheels and some don’t. Larger keeps speed better but takes more effort to accelerate. So depending on taste go for something between 75mm to 90mm. And you want a smooth and grippy ride so a soft wheel with around 77-80A in durometer is good (it’s the measurement of how hard the rubber is). For me I’ve always been a fan of Orangatangs In Heats (75mm and 80A) but the Kegels (80mm and 80A) might be a better bet nowadays. I always thought that the slightest amount of rain would ruin my bearings but I’ve learned that a good set can last you a long time. Only at the end of the Gothenburg-trip did the bearings seem to need a cleaning; and we had been riding in rain atleast once every day for 6 days. Get ones with built in speedrings and spacers so you don’t have to fiddle with lots of small parts, like the classic Biltin or Zealous. Both I’ve had good experiences with. To clean them just drop them in cleaning alcohol, shake them about a little and let sit for up to an hour. Change alcohol if there is a lot of dirt in it, shake and let sit again. Finally let them dry and add either bearing oil or better yet if you want to be safe from rainy weather then lube them up with Phil Woods grease or similar. We only got through the board in this post but there is still a lot more to talk about, like everything that goes into the pack! That’ll be in the next post. Ok, since the last post you’re now a longboard hotshot right? You got the basics down and ready to get some distance going. But where do you go? Lets break down my process for figuring out the trail. First off, how long are you willing to go? Don’t go too crazy for your first few times; the first couple of trips I pushed myself too far which made the trip painful and not very enjoyable. Figure out your limits by starting with day trips at around 20-30km. I find it more fun riding when I have a specific location that I’m aiming for so find something that is approximately that distance; like a small town, a landmark or a store. As mentioned in the last post, it takes me about 35-40 minutes per 10km with no pack and slightly over an hour with a heavy backpack. Obviously any path you take must be asphalt. You can some ride hard packed gravel if you must but it’s not recommended. 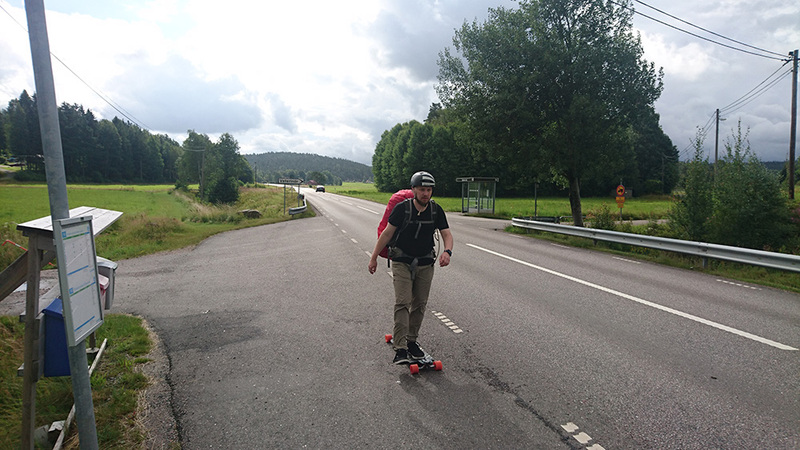 Freeways are obviously off limits (here in Sweden anyway) and you should absolutely avoid 2+1 roads (mostly only found in Sweden). You do not want to ride on the narrow shoulder of a 2+1 road with cars screaming past you at 100km/h. It’s hard to know if a road has a 2+1 segment but from my very un-scientific research (ie, trial and error) I’ve found that roads with numbers higher than 100 usually don’t have 2+1 segments. To help me plan my route I often use Google Maps, just make sure to switch to bike or walking directions to get better results. Google Street View is also a good way of checking out the roads before you ride them. Just check out a few spots on each longer road to see if it has asphalt and roughly the quality of it. But no matter how much you plan, you will stumble upon issues and you will have to improvise and you might have to walk a bit. I’ve found that when map services fail or are out of date then tourist-information kiosks can be a great help for figuring out what roads to take for the next leg of your journey. They were a great help on the Gothenburg trip when we discovered that the planned route had large segments of 2+1 road. So now that you’ve figured out a path to take, lets get into some tips on riding the road. I’ll get into what gear to use in a later post but for now, just make sure you got your board, comfortable shoes, helmet and water. Seriously, bring a bunch of water; don’t get dehydrated. A hydrationsystem (like Camelbak) is great but a few waterbottles work too. When riding try to stay close to the edge of the road while still being comfortable enough to not fall off the road just because you wobbled a little. I’d say a boards width or so of space. Riding on the drawn line works if it’s worn out enough to not be protruding. Sometimes the asphalt can be much better in the car tracks and depending on the amount of traffic I sometime ride there and return to the edge when I see a car coming. Really keep an eye out for traffic though when doing that. As I mentioned in the last post most vehicles give you extra space when passing but be careful of the tailwind of big semi trucks. They can give you a surprising push when you least expect it (ie, standing on one leg when pushing). And always be courteous on the road. Use your arms to indicate turns just as bicyclists do. My biggest fears when going at high speeds are threefold: crossroads/T-junctions, unexpected gaps and construction on the road. By unexpected gaps I mean for example the gap that some bridges have when transitioning from road to bridge. When you don’t know the road already you have no idea what’s coming up just around the corner, forcing you to unexpectedly break hard at high speed which is risky. So be very careful and alert, it might be worth going down a hill slowly when uncertain. This is how you’ll most easily hurt yourself otherwise. You can sometimes keep your speed down by riding on grass next to the pavement but make sure to practise first and don’t use it as an emergency break at high speeds. That follows into another point. Bikepaths are great and you should absolutely use them. But they sometimes have a tendency at crossroads to stop with a sharp curb, something you do not want to experience when going downhill. It might be worth riding on the road instead. Once again, just be careful. Instead of foot breaking on long hills, burning away lots of shoe rubber, I often do push breaking. And by that I mean do a short step and use your leg to try to slow down, like pushing in reverse. It’s a tradeoff of course between the longevity of your shoes and using up the energy in your legs so it depends on your energy-levels and shoes. Phew, that was more tips than I thought it’d be. Hopefully now with all this information in your head you should be able to start doing your own longdistance trips. Next post I’ll go into more nerdy detail about my gear. 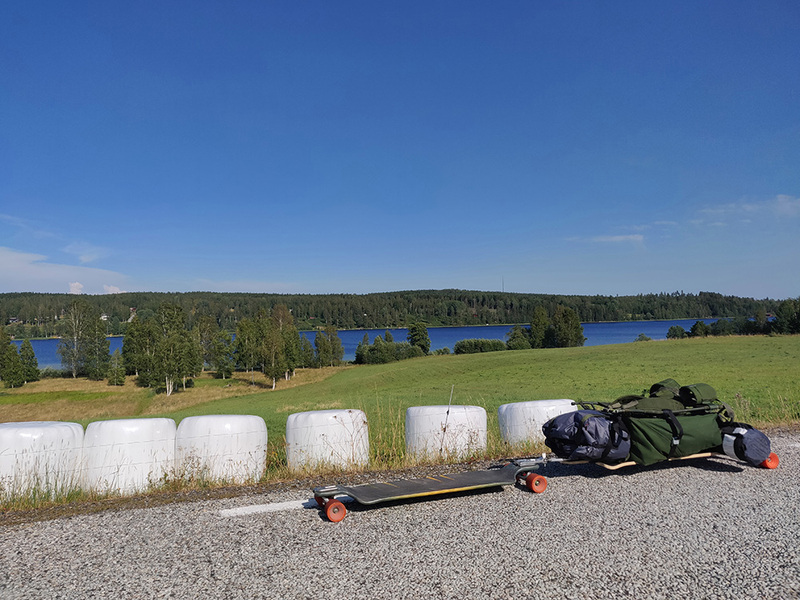 When I meet new people my interest in longboarding can easily pop up and like some kind of low budget door salesman I love extolling its virtues. One of the aspects, which I get most questions about, is my love for riding long distance where you do full day or multi-day trips. And now that I’ve done it for a bunch of years and gathered some experience I figured I’d write a four part series on what I’ve learned, so that you too can start out on your own! I’ve been doing long distance trips pretty much since the first year I started riding, on the first trip I rode 70km in one day and since then I’ve only grown more bold. 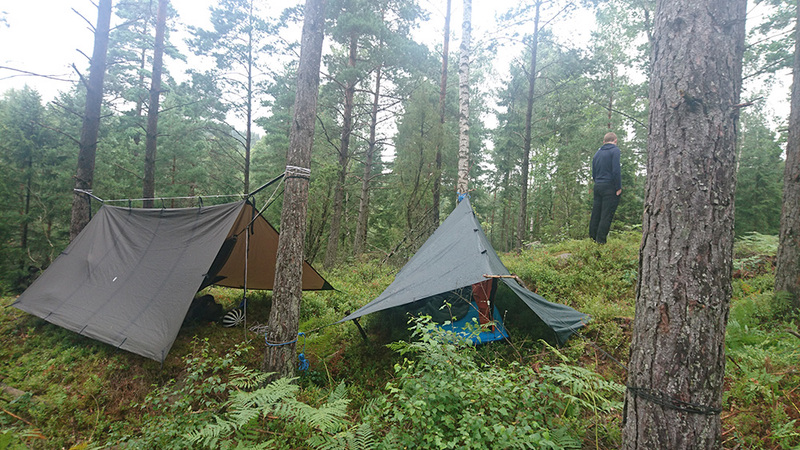 Stockholm to Örebro (210km) in one day and Örebro to Gothenburg (330km) with camping gear in 6 days; add to that a lot of 60km+ day trips around Örebro. Luckily I have my awesome travelmate Fredric Wallin to join me on the longer crazy escapades. Why? you might ask. For me it’s about the calm relaxation I get. Might sound weird with it being a physical activity but no matter how rough the roads get I’m just in the moment, all life’s other worries seem disappear when I’m on my board. 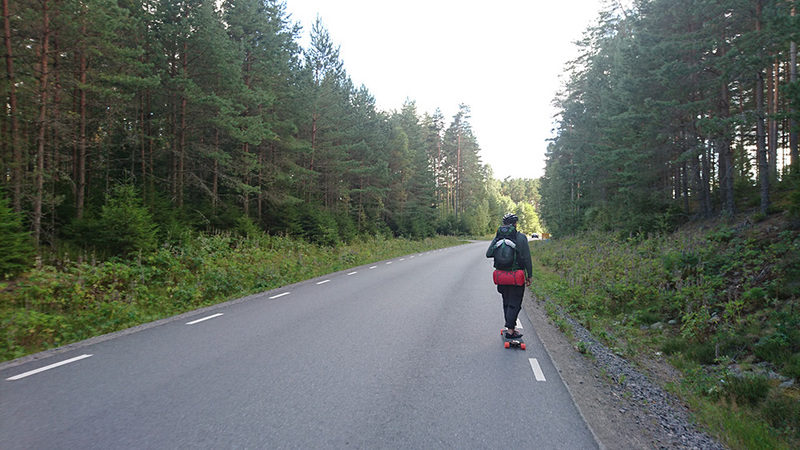 It’s just me and my board riding the road and enjoying the nature surrounding it. When I get back I might be tired but I’m also thoroughly relaxed. I hope I might have piqued your interest by now. 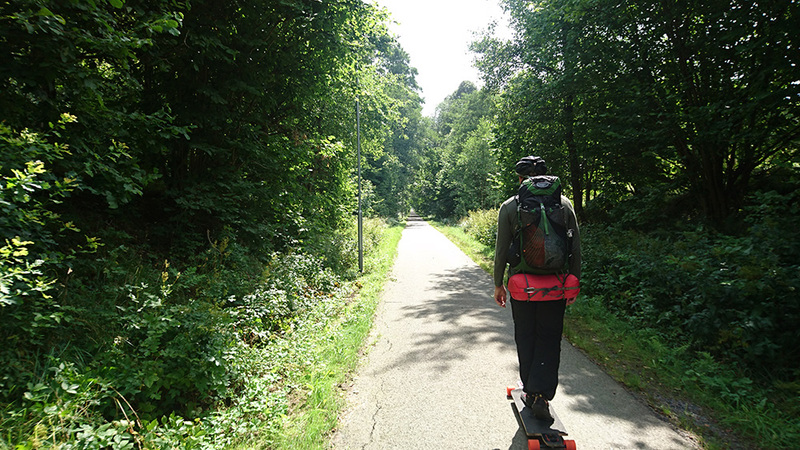 If you’ve never ridden a board before you have a pretty obvious obstacle to get over first… learn to ride. There are a lot of excellent videos on longboarding like the one I just linked so I won’t reiterate all the details. Easiest way to start is to find a friend who has an extra board to borrow it or just join them on a ride out sometime. Like me! If you’re in Örebro then just hit me up and I’ll get you rolling. Of course, you can buy your own but buying is a whole different jungle that I won’t get into now and it probably wouldn’t help you much anyway if you’re new so buy a used board to learn on. And your first board probably shouldn’t be a longdistance board to begin with anyway. Just make sure you’re comfortable with pushing, foot-breaking, turning & carving. You definitely want to be able to switch up your pushing leg so make sure you learn how to ride switch (ie, opposite leg forward on the board). I’d say that learning mongo and switch mongo pushing is also beneficial, this is where you stand on your back foot and push. Oh, and wear a helmet. It’s not worth going braindead over a simple accident. I still wear my helmet everytime I ride and it’s saved me a couple of times over the years. Make sure it’s a skate helmet and not a bike helmet, you want to cover the back of your head. It’s worth having elbow-, knee- and hand-protection when starting out as well. In the next post I’ll get into tips for finding and riding the long lonely road. But until then, I’ll leave you with answers to the questions I get the most. How long does it take to ride 1 mile (swedish mile, 10km)? Depends on you have a heavy backpack or not, without one I’d say it takes about 35-40 minutes per mile and with a heavier backpack it’s a little over an hour per mile. Yes and no, a whole day will get you tired but during the ride you’re mostly fine. You absolutely have to switch which foot you’re pushing with every couple of minutes. Hills will of course affect your energy levels but I usually regain that energy shortly after. Just decrease your speed to conserve energy. But a lot of it is just handling it mentally, being in the right mind set. You keep going. Backpack (if you’re wearing one) should be covered to handle the rain. Otherwise the board will roll on and when the sun comes out again (hopefully) you and your board will get dry again. Isn’t it scary with all the vehicles driving past you? Not really, most drivers give you quite a bit of space. You have to be a little careful with semi trucks because when they pass you by (especially ones with two trailers) they’ll give you a pretty hard gust of wind.